The Incredible shrinking Man desires a more ecological human existence. We’ve outgrown our naturally given space on Earth and are starting to experience the consequences, or even consider exit strategies. But rather than fantasising about a departure from the planet that designed us, we investigate the possibilities to retrofit humanity back into Earth’s future plans. In this quest we’ve been inspired more than once by other than human species, like the pygmy squid, the Pseudis paradoxa or any of the many other dwarf species we’ve listed in the Dwarf Zoo. But it is not just fauna that helps us reprogram our thinking. Often it’s flora as well. Plants have all sorts of interesting strategies to limit size if necessary or desirable. Like jasmonates, the phyto-hormones that keep bonsai trees from growing beyond the possibilities of a limited environment. Almost since the beginning of this investigation we’ve tried to envision a man that understands the bonsai tree, perhaps even better then himself. We’ve wanted to carve out a space where man, flora and fauna re-merge into shared consciousness. A sort of mental mandragora. The roots of the mandragora often look like a little man, even to those without any fantasy for such things. Combined with its hallucinogenic properties it was an obvious receptor for archetypical animistic beliefs and bestowed with fantastic properties. 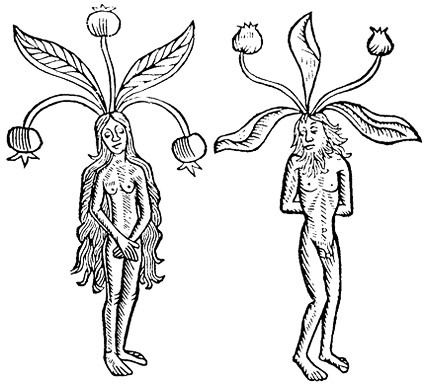 Perhaps suggesting we consider the mandragora as a model for future man is still too intuitive, still too immature and part of some wishful thinking. In the end this is obviously not about a little man with branches for arms, or a walking and talking bonsai, but about a shared consciousness that allows us to find our rightful place in all of life. What can a muddy root teach us?